The Inuit of northern Canada have a long history of shamanism, always very quiet. For at least seventy years it has existed underground when practiced at all. Political, religious, and educational oppression have taken their toll. Thus I refer mostly to the respected elders who play many cultural and spiritual roles, whether or not they are shamans. Motivated by a sense of responsibility to the youth, todayâ€™s elders revive ancient stories and consider bringing back parts of their spiritual past to solve todayâ€™s urgent social and ecological problems. These include teen suicide, drug abuse, domestic violence, and the effects of global warming. The Inuit epic â€œKiviuqâ€ reflects a traditional shamanâ€™s life and practice. I recorded it from forty Nunavut elders in 2004, and later augmented my fieldwork through conversations with younger scholars and activists. Kiviuq taught todayâ€™s elders about animal spirits and other non-human beings, about the consequences of their behaviour and ways shamans moved through the sacred landscape. Kiviuqâ€™s service to the community and protection of an orphan child are highly respected. Women have also been powerful shamans. The Inuit no longer live nomadically, in constant contact with animals and the elements. As the climate shifts, skilled hunters are no longer at home on the ice. Elders feel they must help bring Canadian law to harmony with Inuit values and protect their physical environment. They also recognize the dangers of the spirit world for young people. They focus the power of words on building generosity and understanding instead of using ancient curses. The Han Armyâ€™s shamanic sacrifice, a comprehensive form of this kind, is dubbed â€œShaoxiangâ€ The ceremony is, in fact, a new form of sacrifice that takes shape on the basis of their original ancestorsâ€™ sacrificial customs under the influence of Manchusâ€™ shamanic trance-dance. Hence, it not only takes a final form different from Manchusâ€™ sacrifice, but it is also dissimilar to Chineseâ€™s sacrifice . The sacrificial rite of the Han Army has an exclusive symbolic system. It has outstanding performance, exclusive cognition value and particular function. For example: Sacred symbols, Evil-expelling and luck-embracing, Clan cohesion and Clansmen enlightenment. This paper discusses the ethnoaestheics of the Shamanistic folk performance like Padayani in the Kerala. Padayani is a ritualistic art form performed in the sacred groves of Central Kerala especially in Pathanamthitta district. It is a form of ritualistic folk theatre dedicated to the primal Goddess. The performance that begins after harvest lasts 28 days that uses evocative language. The story most commonly dramatised in Padayani is the scene after the annihilation of Darika, when Kali sets out on her Kailasa journey. To make Kali sober and calm, Subramanyan and the boothas in different forms of kolam take up a procession in front of her. A procession of Pakshikkolam (mask of bird), Yakshikkolam, Maruthakkolam etc. is presented on her way to appease her; figures are drawn on the sheaths of areca palm in vibrant colours and there is much musical extravaganza. Figures are drawn in natural colours in which the enlarged shape of eyes in the night light glitter and seem to project up. This shamanâ€™s performance begins after the harvest with elaborate rituals. Each day diverse kolams (masks) do the performance with a number of magical songs having very strong rhythmic thalas on the instrument thappu (beating instrument). The whole village participates in it. After the padayani there is a ritual related to fertility called Vithidal (sowing the seeds). Sacred â€˜thottam pattuâ€™ is sung as part of Padayani performance and also in connection with the worship of Kali and others. Thottam is derived from the root â€˜thondrukaâ€™ meaning â€˜to createâ€™.Â Shamanistic Kolam thullal usually begins with the â€˜thottam paattuâ€™ (ritualistic ethnomusic) narrating the myth of Gods and is an invocation of the spirit and faith of the entire village. The myth of the deity sung with the accompaniment of â€˜thappuâ€™ instrument is thottam pattu. This paper examines the process of how private rituals carried out by Zhuang female shamans (memoeds) have been transformed into public performance in a post-socialist Zhuang society. Memoeds are popular ritual practitioners in southwest Guangxi, China. Their rituals had been identified as â€œsuperstitiousâ€ by officials carrying out government policy regarding the elimination of superstitious practices. Local Zhuang people believe that their hometown of Ande is where their hero, Nong Zhigao, established his Southern Heavenly Kingdom a thousand years ago. In 2005, a memoed and a group of local women conducted two private rituals, one inside a dark cavern and one in front of a Nong Zhigao temple in the woods, a day before the first â€œCommemorating National Hero Nong Zhigao Festivalâ€ opened to the public in Ande. Seven years later in 2013, a group of female performers dressed in memoedâ€™s costumes performed in front of government officials during a folk culture and art festival held in Ande on a traditional song festival day. Performing memoeds in a culture and art festival corresponds to one of the two strategies of â€œdoing religionâ€ in China outlined by Adam Chau (2011:6-7). Zhuang people are â€œdoing cultureâ€ as a strategy to protect folk religious practice. 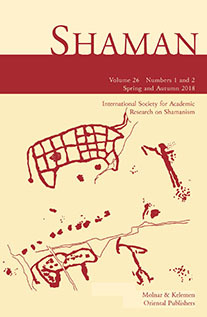 This paper both illustrates how local Zhuang people â€œdo cultureâ€ in Ande and also explains why only shamans, one type of ritual practitioner among the three kinds present in the village, have been chosen to represent local folk culture and art. The Adiyar, first people, are the inhabitants of the Waynad, Western Ghats of Kerala. They have preserved their shamanistic indigenous tradition of ethnomusic and mysticism in the Gadhika Performance. The rhythm of percussion instruments, Thudi and sacred chants reverberated in the nights. Healing through magic is the principle of the performance. The songs, movements, and the diagnostic sign language express the ASC of the performer. The performance acts as a healing therapy for the community.